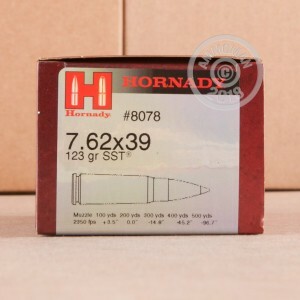 Test the mettle of your SKS or AK rifle against deer, hogs, and other midsize game with this Hornady 7.62x39mm ammunition. 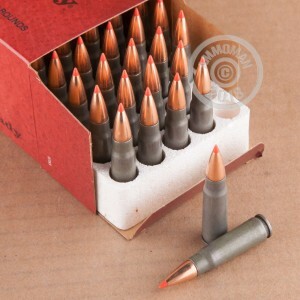 These cartridges use the non-reloadable steel cases and Berdan primers that 7.62x39mm rifles were designed to work with, albeit manufactured to a much higher quality standard than your typical surplus or range ammo. The steel cases come with a polymer coating that promotes reliable cycling. The SST bullet is where this ammo really sets itself apart from the competition. Developed by Hornady for superior hunting performance, SST bullets feature a polymer tip that enhances external ballistics and helps regulate expansion when the projectile strikes an animal. A locking ring keeps the core and jacket together for maximum energy transfer, while a boat-tailed profile provides added stability for those longer-range shots on windy days. 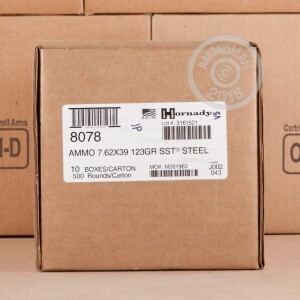 Premium hunting ammo doesn't come cheap, but AmmoMan.com is here to help. Order any products totaling $99 or more from our website and qualify instantly for free shipping and handling.